Stud Hi-Lo is one of the most popular games at various poker sites, US as well as international, thanks to its split pot structure. Awarding half the pot to a low hand and half to a high hand means this game is extremely action packed. In fact, if you’re of a somewhat nervous disposition, then Stud Hi-Lo probably isn’t the poker variant for you. However, if you’re slightly skittish and have a dual personality, then this game will be perfect. Operating along the same lines as Stud poker, but with a subtle twist, Stud Hi-Lo is gradually becoming the preferred format for some of the top online poker pros in America. Before we go any further, however, we feel it’s important to point out that Stud Hi-Lo isn’t for the fainthearted. Although the mechanics of the game are fairly simple once you’d got to grips with them, the amount of concentration it takes to understand its dynamics aren’t necessarily suitable for beginners. When you first ante-up at a poker table you’ll want to spend as little time as possible mastering the basics so that you can focus on improving your overall strategy. During your first few sessions of Stud Hi-Lo poker you’ll probably find that you’ll struggle to keep up with the action. 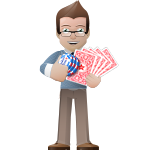 Thus, when you do decide to make the jump into one of these games, you should already have a developed poker strategy. Because of this, we recommend playing some Texas Hold’em or Stud Hi at one of our suggested top USA poker sites before you delve into the matrix of this split pot variant. 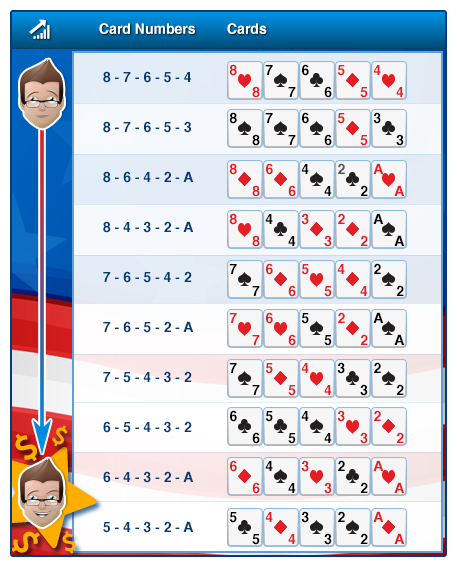 Stud Hi-Lo poker uses a split pot format. 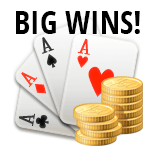 Half the pot is award to the winning low hand and half the pot is given to the winning high hand. If there is no qualifying low hand (an eight low minimum) then the best high hand scoops the pot. Stud Hi-Lo doesn’t involve community cards. In the event of the deck running out of cards, a single community card can be dealt. We recommend honing your skills at the Stud table before indulging in a few sessions of Stud Hi-Lo at a top USA poker sites. 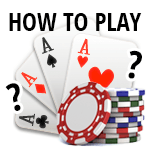 Stud Hi-Lo is a limit poker game and when it comes to betting, it’s virtually identical to Stud Hi. In contrast, this variant is almost a complete opposite to popular poker games in the United States such as Texas Hold’em. The first major difference is that the forced bets are known as antes and they don’t follow the same pattern as the “small blind” and “big blind” that you find in games such as Hold’em. To stimulate action, Stud Hi-Lo games start with each player at the table putting in an ante which is equivalent to the minimum table stakes, e.g. a $2/$4 game will usually have a $0.30 ante. After this, players are dealt their first three cards (two face down and one face up) and the player with the lowest up card is forced to pay the “bring in”. The size of the bring-in can be the size of the ante or the full size of the table’s lowest stake, e.g. in a $1/$2 game the bring-in can be $1. Once this round of betting has been completed, the remaining players are dealt a fourth card face up and the player with the highest value card is the person who leads the betting. *Note, unlike seven card stud, there is no double-sized opening bet allowed if a player makes a pair on Fourth Street. This pattern continues as a fifth and sixth card are dealt and only changes on the river (the seventh card), when the card is placed facedown on the table. The first player to bet in this final round is the one with the highest value cards on display. After Seventh Street has been dealt the remaining players must expose their card, unless one player forces everyone else to fold. In Seven Card Stud Hi-Lo, the low hand is played with an eight or better qualifier. This means that a low hand must contain an eight-low. If there is no qualifying low hand, the high hand wins the entire pot. If there is more than one remaining player when the final betting round is complete the last bettor or raiser shows his or her cards first. If there was no bet on the final round, the player in the earliest seat shows his or her cards first. The player with the best five-card hand for the high wins half the pot, and the player with the best hand for low wins the other half of the pot. In the event that no hand qualifies for low, the best hand for high wins the entire pot. In the event of two or more players have the same high or low hands, the pot halves will be split accordingly. In the case of ties during the bring-in, the first person to act is decided by card suit. 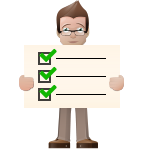 Suits are ranked in alphabetical order: clubs (lowest), diamonds, hearts and spades (highest). If the player with the lowest card showing on Third Street is all-in for the ante and they are consequently unable to make the required bring-in bet, the bring-in moves clockwise to the next player at the table. Stud games are played with eight players and because it’s possible to run out of cards before Seventh Street is dealt (because there’s only 52 cards in the deck), a single community card can be dealt face up to help determine a winning hand.